It’s not as if we’re lacking history as to how this works. Some two decades ago the Greenspan Fed’s “asymmetrical” (baby-step “tightening” measures versus aggressive rate slashing and market support) policy approach emboldened speculation and nurtured precarious Bubble Dynamics. “Asymmetrical” then took on a whole new meaning during the post “tech” Bubble backdrop, as the Greenspan/Bernanke Fed held rates at 1% in the face of double-digit mortgage Credit and house price inflation. Confidence that the Fed (and Washington) would never tolerate a housing bust proved integral to prolonged excesses that ensured a historic Bubble. Credit is inherently unstable. Market-based Credit is potentially highly destabilizing. And I would strongly argue that the proliferation of market-based Credit within a global backdrop of unfettered “money” and Credit is a recipe for catastrophe. This is the heart of the problem that officials refuse to acknowledge. The Fed responded to market changes, although it took the opposite approach: Monetary policy shifted to providing an increasingly unstable marketplace more certainty, liquidity and market backstops. Moreover, the Fed looked the other way as the GSEs evolved into powerful liquidity backstops for the leveraged speculating community. The Fed repeatedly accommodated market speculation, as the game became rigged in favor of sophisticated market operators. Indeed, the activist Federal Reserve turned progressively assertive in using market manipulation as a stimulus mechanism. Back in 2011, when the Fed was formalizing its “exit strategy,” I titled a CBB “No Exit.” At the time the Fed publically detailed its plans for normalizing interest rates and, importantly, its balance sheet that had inflated to $2.1 TN. I was confident that our central bank was much too optimistic in the markets’ capacity to absorb the selling associated with the Fed shrinking its securities holdings. I had no idea that rather than “normalizing” the Federal Reserve’s balance sheet a few years later would approach $4.5 TN. I have in the past posited that the individual QEs exerted quite divergent effects. QE1 essentially accommodated marketplace deleveraging. If not for QE1, the hedge fund and derivative complexes would be a fraction of their current size. QE2 unleased massive liquidity that fueled “Terminal Phase” excess throughout EM and commodities Bubbles. Then, with EM Bubbles faltering and bond markets floundering, the QE3 liquidity onslaught set it sights on the asset class with the strongest upward momentum at the time: equities. Liquidity will seek out assets with the strongest inflationary biases. Yet the Fed remained disinterested in the actual consequences of its “money”-printing operations. Theory claimed that injecting huge amounts of liquidity into the securities markets would raise the general price level and spur spending, investing and economic development more generally. If results demonstrated less than effectiveness, it was only because monetary stimulus had been employed in insufficient quantities. When the Bernanke Fed scrapped its “exit strategy” it was imperative to avoid conveying an “asymmetrical” approach to its balance sheet – that it would be very hesitant to reduce holdings (extract liquidity from the marketplace) while quick to aggressively expand its securities portfolio (create liquidity). The Fed needed to state emphatically that the nuclear option was now off the table. Our central bank did the opposite and the predictable materialized: the Fed (and global central bankers) became hostage to runaway securities market Bubbles. Bernanke committed yet another huge blunder back in 2013 – one that went largely unnoticed. When an intense “risk on” market backdrop began to waver, he commented that the Fed was ready to “push back against a tightening of financial conditions.” By this time, booming securities markets had become even more essential to the functioning of the broader economy – through both the financing channel (debt and equity) and wealth effects. That the Fed years after the crisis was so sensitive to any indication of fledgling market risk aversion, along with the Fed repeatedly delaying even a little 25 bps start to rate “normalization,” essentially signaled to the marketplace that the Fed had little tolerance for a bout of “risk off,” let alone a bursting Bubble or bear market. The Fed should have from the get-go (2009) – back when the scheme was developed to induce “money” into the risk markets; back when the securities markets and associated wealth effects were the centerpiece of extraordinary post-Bubble reflationary measures – they should have formulated a strategy to ensure it did not become locked into sustaining market Bubbles of its own making. Somehow, the overarching central bank “financial stability” mandate has morphed into ensuring Bubbles don’t burst. Back in the 1960s, Alan Greenspan was said to have explained to a group of ideological compatriots that the Great Depression was caused by the Fed repeatedly putting “coins in the fuse box” during the Roaring Twenties Bubble period. About the same time, Milton Friedman came with a revisionist view: the twenties were the “Golden Age of Capitalism,” while responsibility for the Great Depression rested primarily with the derelict Federal Reserve that failed to both administer aggressive monetary stimulus after the stock market crash and recapitalize the banking system. (Friedmanite) Dr. Bernanke professes that a senseless shortage of money was the root cause of economic depression. If only helicopters had been available to drop money on families to buy shoes and automobiles; on corporations to invests and hire; on governments to spend; and on banks to recapitalize and lend – the despair and destruction of the Great Depression could have been avoided. I side with the Roaring Twenties “coins in the fuse box.” Repeatedly, the inexperienced Fed backstopped the boom. The perception that the Fed could abrogate financial and economic crises became paramount. Confidence was certainly bolstered by momentous technological advancement coupled with unmatched gains in national wealth. And throughout the decade, securities speculation and leveraging proliferated. After awhile it seemed normal. Securities leveraging had surreptitiously evolved into the prevailing source of system Credit and leveraging that was fueling a highly imbalanced “Bubble Economy.” By the late-twenties, “Wall Street” had essentially become a massive financial scheme, reliant on ever increasing amounts of securities Credit and speculative excess. Intense speculation, liquidity abundance and booming securities markets had financed scores of enterprises that were viable only so long as the Bubble continued to inflate. The financial scheme collapsed with the 1929 stock market crash, ushering in a period of acute instability for both the financial system and real economy. The Great Depression was fundamentally the system’s response to the deep systemic structural impairment that had compounded throughout the Bubble period. Long ago it was well understood that central banks should not be in the Credit allocation business. There needed to be an intense debate when the Greenspan Fed bailed out the stock market in 1987, slashed rates and manipulated the yield curve in the early-nineties, and then became intensely involved in various bailouts throughout the nineties. There needed to be an intense debate about the role of the GSEs. There needed to be an intense debate about the radical notions of Dr. Bernanke. There needed to be an intense debate about the Fed’s ploy to use mortgage Credit to reflate. There needed to be an intense debate about the Fed targeting securities market inflation and all the QEs. Policies were accepted without serious discussion in 1987 because of the fear of another Great Depression; in the early-nineties because of fear of deflation, ditto the nineties as well as the new Millennium. Noland: Moving short-term rates slightly above zero surely does not mark the end of years of extraordinary policy accommodation. Noland: The concept of a so-called ‘neutral’ Fed funds rate is deeply flawed. The securities markets now dictate whether the backdrop is “expansionary” or “contractionary” – and powerful “risk on” or “risk off” dynamics can these days take hold at any level of short-term interest rates. Noland: The acutely unstable Bubble backdrop will for the duration provide convenient justification for gradualism. More importantly, maintaining extraordinary accommodation and prolonging Bubble excess only exacerbates structural impairment and systemic risks more generally. Noland: With the fragile global (faltering Bubble) backdrop in mind, such comments signal to market participants that another round of QE is virtually inevitable. Noland: Market participants are all too confident that the Fed subscribes to the “whatever it takes” monetary management school of ensuring that Bubbles don’t burst. When de-risking/de-leveraging starts to gain momentum, bond yields collapse in anticipation of safe haven demand and crisis management policy measures. Chair Yellen may see this as an “automatic stabilizer,” while I view it as yet “Another Coin in the Fuse Box.” Bear markets and recessions are Capitalism’s indispensable circuit breakers. Noland: “The Fed has learned frustratingly little from previous fiascos. Extended periods of ultra-low interest rates in conjunction with public assurances of liquidity support and market backstops promote leveraged speculation along with associated financial and economic imbalances. Central bank “transparency” is pro-Bubble and thus counter-productive to financial stability. Noland: More importantly, global Bubble and policy backdrops ensure the FOMC's (and global central banks’) proclivity to use unconventional monetary policy (i.e. QE) in response to market disturbances. At this stage of heightened monetary disorder, prospects for more “whatever it takes” central bank stimulus is highly destabilizing for global markets. It was another highly unsettled week in the currencies. The dollar index dropped 1.6%, with prevailing dollar weakness versus EM and developed currencies. The South African rand jumped 4.9% and the Brazilian real gained 3.4%. The commodity currencies – Australia, Canada and New Zealand – all gained at least 2%. The euro traded near a six-month low. The Malaysian ringgit gained 3.6% and the Turkish lira rose 2.0%. With the Japanese yen trading near 17-month highs, Japan’s Nikkei equities index sank 4.9% (down 15.1% y-t-d). Global equities were erratic. Italian equities dropped 2.1%, as the Italian bank index sank 5.8% (down 33.4% y-t-d). European banks had another rough week, with the STOXX Europe 600 Bank Index down 2.7% (down 21.9% y-t-d). Spanish stocks declined 2.1%, and French stocks posted a small loss for the week. Germany’s DAX index declined 0.6%. U.S. stocks responded strongly to Yellen, although there were notable divergences. The more speculative sectors enjoyed a big week. The biotechs surged 5.7%, the Nasdaq100 gained 2.9% and the small cap Russell 2000 surged 3.5%. At the same time, the banks (BKX) slipped 0.2% and the Transports declined 0.5%. It was as if the markets were admitting that the ultra-dovish policy stance would do little to boost real economy fundamentals - but perhaps a lot to spur speculation and market mayhem. Global bond markets love it. March 21 – Financial Times (Ed Crooks): “About 600 people packed on to the Machinery Auctioneers lot on the outskirts of San Antonio, Texas, last week to pick up some of the pieces shaken loose by the oil crash. Trucks, trailers, earth movers and other machines used in the nearby Eagle Ford shale formation were sold at rock-bottom prices. One lucky bargain hunter was able to pick up a flatbed truck for moving drilling rigs — worth about $400,000 new — for just $65,000… The fire sale in Texas is just a small part of the worldwide value destruction caused by the oil decline. From Calgary to Queensland, oil and gas businesses are scrambling to sell assets, often at greatly reduced prices, to pay back the debts incurred to buy them… It is a reflection, some say, of worries about the destabilising effects of the industry’s mountain of debt. From 2006 to 2014, the global oil and gas industry’s debts almost tripled, from about $1.1tn to $3tn…"
The inflationists will surely continue to lament insufficient “aggregate demand,” while espousing the virtues of Trillions more of “money”. But let’s not lose sight of the fact that “From 2006 to 2014, the global oil and gas industry’s debts almost tripled, from about $1.1tn to $3tn.” The problem was clearly too much “money” and Credit stoking boom-time excess. Aggressive rate and QE policy measures played an integral roll in the funding free-for-all that has come home to roost for the global oil patch. And, today, monetary accommodation will do little to ameliorate the energy bust, not with liquidity and speculation preferring ongoing Bubble Dynamics throughout “Silicon Valley”, commercial (and residential) real estate and anything providing a yield. Our central bankers, by fixating on fragility while ignoring segments of intense excess, are ensuring even more precarious Monetary Disorder. BERKELEY – Globalization is entering a new era, defined not only by cross-border flows of goods and capital, but also, and increasingly, by flows of data and information. This shift would seem to favor the advanced economies, whose industries are at the frontier in employing digital technologies in their products and operations. Will developing countries be left behind? For decades, vying for the world’s low-cost manufacturing business seemed to be the most promising way for low-income countries to climb the development ladder. Global trade in goods rose from 13.8% of world GDP in 1985 ($2 trillion) to 26.6% of GDP ($16 trillion) in 2007. Propelled by demand and outsourcing from advanced economies, emerging markets won a growing share of the soaring trade in goods; by 2014, they accounted for more than half of global trade flows. Since the Great Recession, however, growth in global merchandise trade has stalled, mainly owing to anemic demand in the world’s major economies and plummeting commodity prices. But deeper structural changes are also playing a role. Many companies are simplifying and shortening their supply chains. For a range of goods, automation means that production location and outsourcing decisions no longer depend primarily on labor costs. Quality of talent, infrastructure, energy costs, and speed to market are assuming greater weight in such decisions. In the near future, 3D printing could further reduce the need to ship goods across long distances. If trade in global goods has indeed peaked relative to global GDP, it will be harder for poor countries in Africa, Latin America, and Asia to develop by becoming the world’s next workshops. But globalization itself is not in retreat. While global goods trade has stalled and cross-border financial flows have fallen sharply since 2007, flows of digital information have surged: Cross-border bandwidth use has grown 45-fold over the past decade, circulating ideas, intellectual content, and innovation around the world. New research from the McKinsey Global Institute (MGI) finds that cross-border flows of goods, services, finance, people, and data during this period increased world GDP by roughly 10% – roughly an additional $7.8 trillion in 2014 alone. Data flows accounted for an estimated $2.8 trillion of this gain, exerting a larger impact than global goods trade – a remarkable finding, given that the world’s trade networks developed over centuries while cross-border data flows were nascent just 15 years ago. Digitization disrupts everything: the nature of goods changing hands; the universe of potential suppliers and customers; the method of delivery, and the capital and scale required to operate globally. It expands opportunities for more types of firms, individuals, and countries to participate in the global economy. It also gives countries and companies everywhere an opportunity to redefine their comparative and competitive advantage. For example, while the United States may have been at a disadvantage in a world where low labor costs were paramount in global manufacturing value chains, digital globalization plays directly to its strengths in technology and innovation. On its face, this shift to digital globalization would seem to work against developing countries that have large pools of low-cost labor but inadequate infrastructure and education systems. Advanced economies dominate MGI’s latest Connectedness Index, which ranks countries on both inflows and outflows of goods, services, finance, people, and data relative to their size and share in each type of global flow. These flows are disproportionately concentrated among a small set of countries, including the US, the United Kingdom, Germany, and Singapore, with huge gaps between the leaders and laggards. China is the only emerging economy to have made it to the top ten on the index. Yet digital flows offer developing countries new ways of engaging with the global economy. The near-zero marginal costs of digital communications and transactions create new possibilities for conducting cross-border business on a massive scale. Alibaba, Amazon, eBay, Flipkart, and Rakuten are turning millions of small enterprises around the world into “micro-multinational” exporters. Companies based in developing countries can overcome local market constraints and connect with customers, suppliers, financing, and talent worldwide. Twelve percent of global goods trade is already conducted in ecommerce channels. Moreover, a country need not develop its own Silicon Valley to benefit. Countries on the periphery of the network of global data flows can benefit more than countries in the center. Digital connections promote productivity growth; indeed, they can help developing economies move to the productivity frontier by exposing their business sectors to ideas, research, technologies, and best management and operational practices, and by building new channels to serve large global markets. But the Internet cannot deliver such improvements in efficiency and transparency unless countries build the digital infrastructure needed to connect the world’s huge offline population. The number of Internet users worldwide now exceeds 3.2 billion, but at the end of 2015, 57% of the world’s population, or four billion people, remained offline, and many who are online use only basic cell phones. In many developing countries, connectivity is too slow, unreliable, or expensive to allow entrepreneurs and individuals to take full advantage of the new global business and educational opportunities. Education systems will also need to keep up with demand for language fluency and digital skills. While 40% of the world’s population are connected to the Internet, 20% are still unable to read and write. According to another recent MGI study, there are also large gender gaps in access to digital technologies around the world, and this lack of access impedes women’s economic and social empowerment. Lagging countries that fail to promote gender equality, invest in education, and adopt broader governance and regulatory reforms risk falling even further behind in reaping the significant benefits of globalization. Twenty-first-century globalization, driven by digitization and rapid changes in competitive advantage, can disrupt local industries, companies, and communities and cause job loss, even as it spurs greater productivity, boosts overall employment, and generates economy-wide gains. Governments must consider these trade-offs carefully, and develop ways to support those who are harmed by global flows, giving them paths to new roles and livelihoods. To date, few governments have done so. Ironically, the political backlash against globalization is gaining momentum in many places even as digitization increases the opportunities and economic benefits that globalization has to offer. Fear and regulatory pressure is pushing the globalised rich to bring tens or even hundreds of billions of portfolio investments out of Europe and into the US, and to do so within the next year and a half. The fear is not just created by Isis, the Islamist militant group, targeting Europe, but by the unintended consequences of the accelerating schedules European institutions face for complying with “Gatca”, an acronym for the international sharing of data among tax authorities — rules that US authorities believe bind others, but not themselves. Swiss-based investment managers will tell you that this is another example of American hypocrisy, and they are correct. This is true. The 2010 Foreign Account Tax Compliance Act requires international financial institutions to report details of their US clients’ accounts. The American drive to force compliance with Fatca led, in turn, to the OECD’s Common Reporting Standard (CRS). So far, more than 96 countries have agreed to reply, with one notable exception: the US itself. While the US administration and the Treasury declared themselves all in favour of adopting the CRS, they do not have the budget authorisation or appropriation from Congress to spend anything to do so. Therefore, while Switzerland set a deadline of January 1 2017 as the “effective date” for starting CRS-based tax information sharing with the other 95 signatories, the US Internal Revenue Service will not give its “reciprocal” partners any information about the foreign beneficiaries of any “entities”, such as Nevada or South Dakota trusts. The Swiss lawyers and asset managers are right. The US government is being hypocritical. Coincidentally, asset managers in places such as Miami, New York, Boston and Nevada stand to benefit from that hypocrisy. Tax justice activists say the US failure to reciprocate the information sharing it demands from others is turning the US into the largest tax haven in the world. But there is more to it than that. Developed-world financial institutions and lawyers are putting themselves at grave risk if they openly encourage tax evasion. This all requires some fine legal parsing and carefully built financial structuring. After all, if you are a non-US resident, you are governed by the “anti-avoidance” rules of the CRS. Those rules invalidate anything done to avoid CRS reporting, as distinct from maintaining privacy. The anti-avoidance laws and their implementation dates vary from country to country. The effect of CRS and Gatca strong-arming global money into the US is another example of the broad consequences of the return of nationalism. Even Mr Buchanan agrees that what he calls “the micro biz of very rich dual nationals with lots of money will continue”, but that will become a much more intricate activity. I would recommend Cosmopolites, a book by Atossa Abrahamian about the economics of nationality acquisition. Rich globals can whisper through EU passport controls with a Maltese passport and their money can be shielded by US portfolio managers. Most people will be waiting in line eternally, holding their wads of rupiahs and shillings. Globalism has come and gone before. Consider those rich cosmopolites who lived in the Silk Road cities of central Asia. Their houses and wealth left only sand-filled lines of brick in the sand. 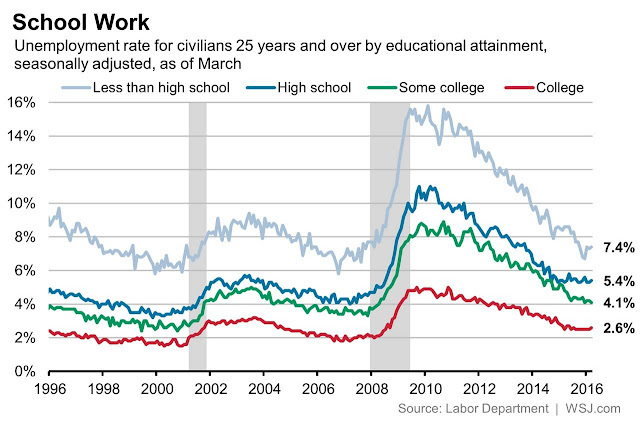 The share of Americans working, or looking for work, rose to 63%, the highest since early 2014. 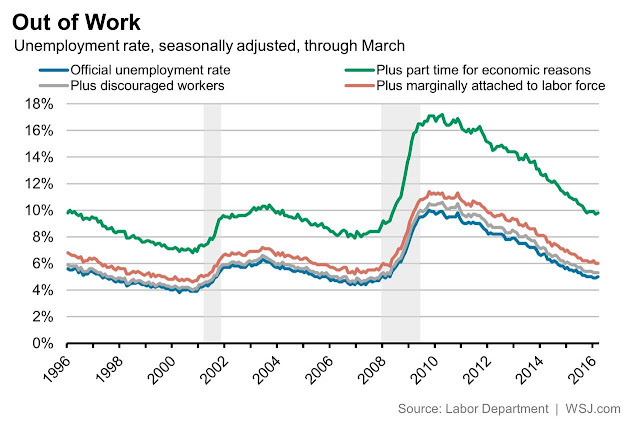 U.S. employers added 215,000 jobs in March, but the unemployment rate ticked up to 5% as more Americans looked for work. 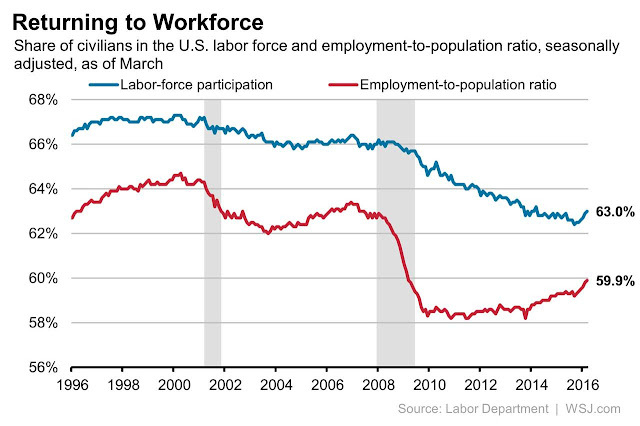 Here’s a look at the guts of the monthly employment report. 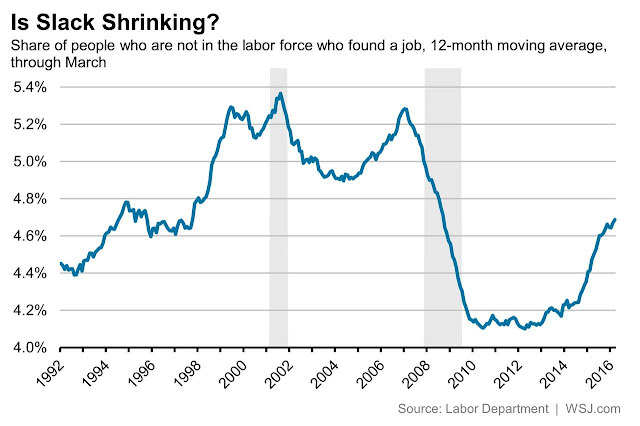 The share of Americans working, or looking for work, rose to 63%, the highest since early 2014. The number of Americans with jobs rose to the highest level since early 2009. 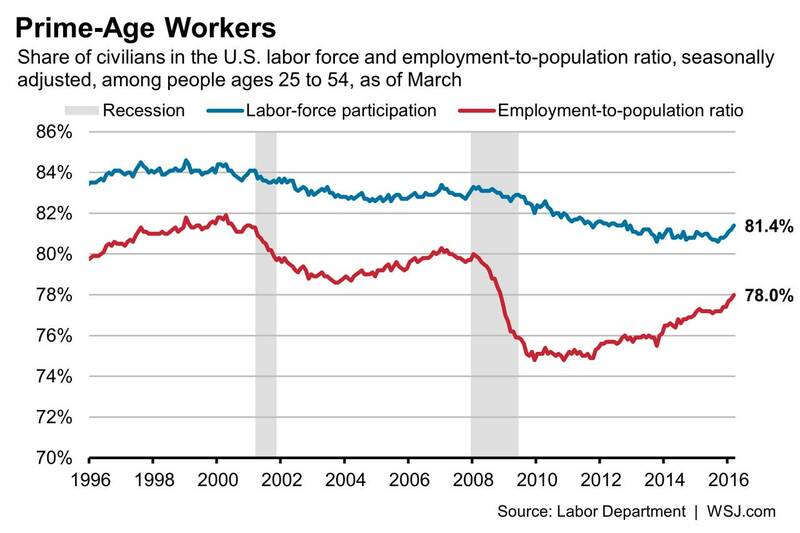 Labor-force participation among workers ages 25 to 54, the years Americans are mostly likely to be working, also climbed this month, though it remains lower than prior to the recession. The unemployment rate ticked up to 5% as a result of the increase in the labor force. The broadest gauge of unemployment and underemployment rose to 9.8% in March from 9.7% in February. 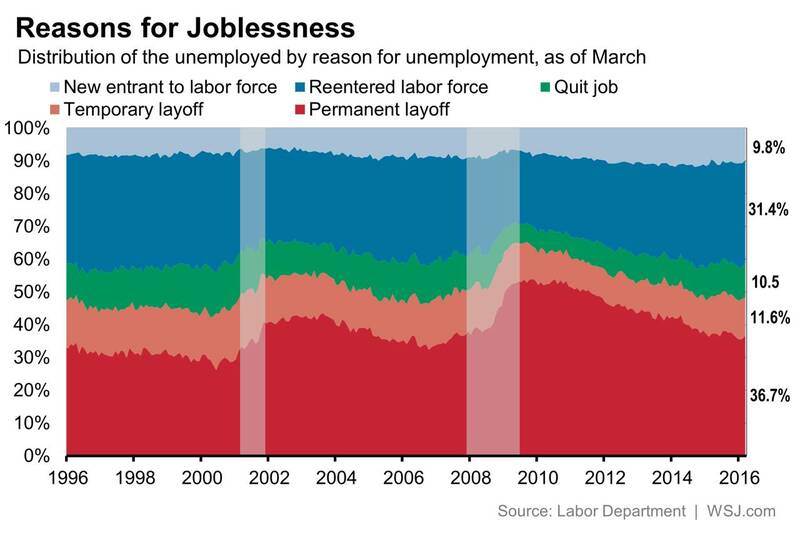 One year ago, the unemployment rate stood at 5.5%, and the broader gauge of underemployment stood at 10.9%. Unemployment rates rose slightly for college graduates, high-school graduates and high-school dropouts this month, following the slight increase nationally. 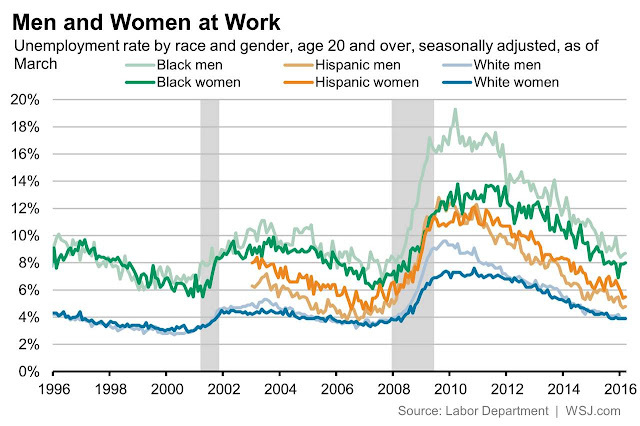 Unemployment rates also climbed slightly for black and Hispanic men and women this month. The rate was unchanged for white men and women. The trend in recent years, however, has been steadily downward for all major demographic groups. 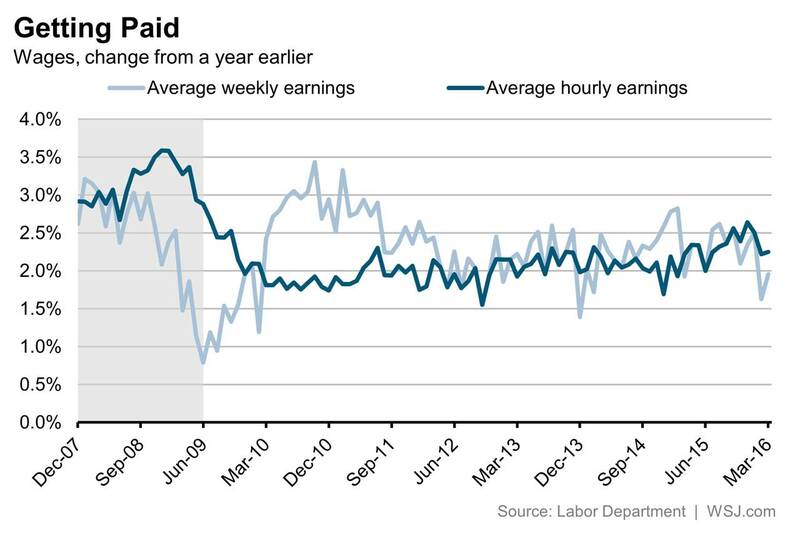 Average hourly earnings are up around 2.3% from a year earlier. Average weekly earnings stumbled in February as employers cut back on hours. 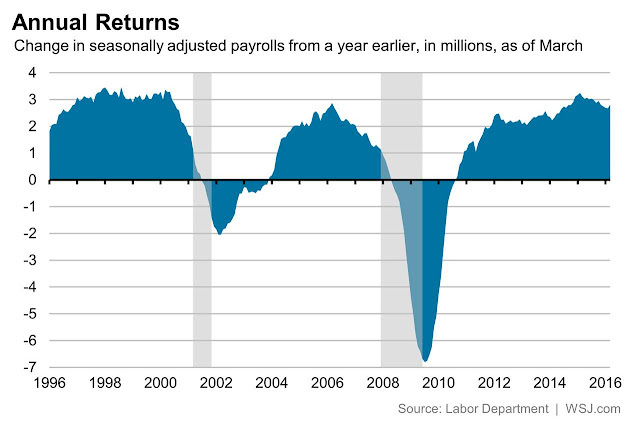 March saw some bounce back on that front, and average weekly earnings are up around 2% over the past year. The share of workers unemployed due to a permanent layoff climbed slightly last month, rising to 36.7% from 35.7%. But over the course of the recovery, fewer of the unemployed have lost their previous jobs. 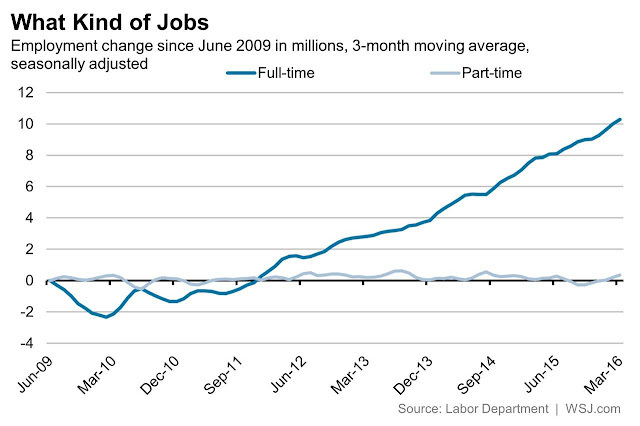 Employers have added 2.8 million jobs over the past 12 months, the best pace since last November. The share of the unemployed who’ve been without work for six months or longer had been steadily declining until the middle of last year. It hasn’t made much progress since then. 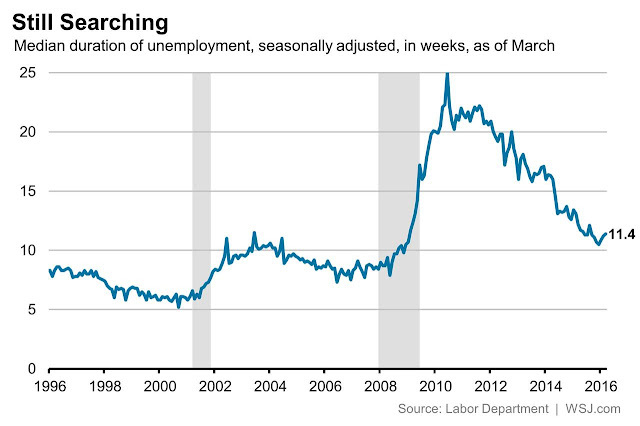 For the past three months, spells of unemployment have been lasting slightly longer. The median unemployed worker has been without work for 11.4 weeks right now, up from 10.5 weeks in December. 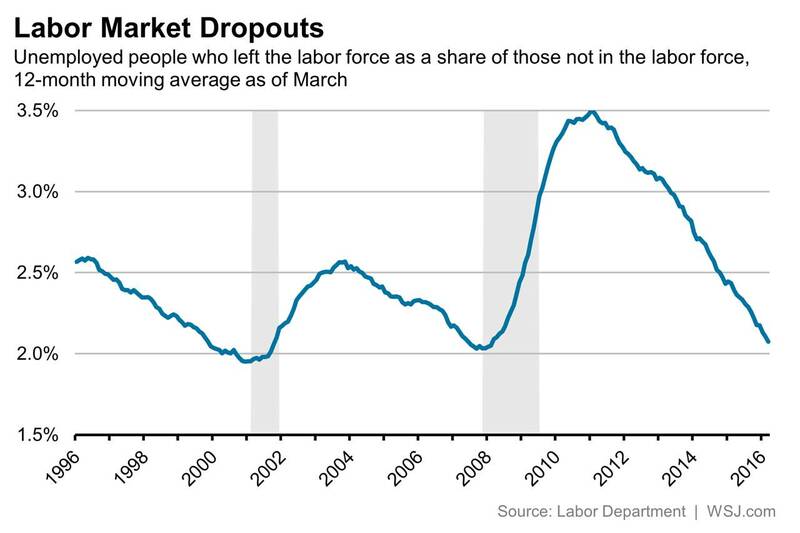 The share of Americans who weren’t in the labor force and who found a job in March ran to the highest level since September 2008. 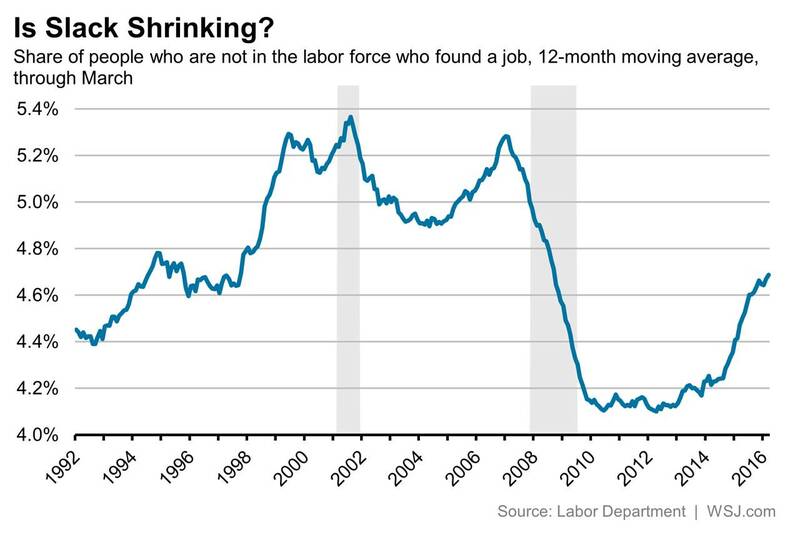 Meanwhile, the share of Americans who don’t have a job and are quitting the workforce altogether has fallen back to where it was when the last recession began. Around 10 million more people are working full-time jobs (or are working at least 35 hours a week) compared with when the current economic expansion cycle began in the middle of 2009. 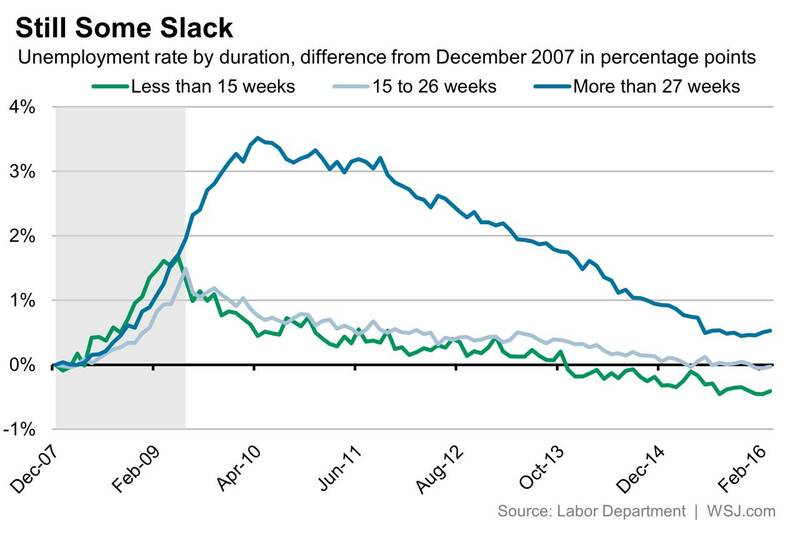 The number of people working part-time has been essentially flat over that span. Since the end of 2007, when the last recession began, the economy has recovered all of the full-time positions that employers shed. The net change in full-time hiring is closer to the net change in part-time hiring of around three million new Jobs. China: Soft Landing or Bust? China’s stock market ‘bubble’ was fueled by "speculative mania" which has proven to have had grave implications of the global stock markets. The collapse of this "speculative mania" will have far reaching ramifications on our current global stock markets. This indicates that Central Bank interventions cannot alter market cycles. Chinese exports have seen their sharpest drop in almost seven years which is adding to concerns of the health of the worlds’ second largest economy. Exports have dropped sharply, by 25.4%, from the previous year, while imports fell 13.8%. This weak data comes on the heels of Beijing registering their ‘ slowest economic growth in 25 years’. The Chinese stock markets have been the most interesting financial news story occurring in 2015. The worlds’ second largest economy and its’ stock markets were soaring in The Shanghai Stock Exchange Composite Index, (SSEC), which is the equivalent of the U.S. SPX. These gains were the equivalent of trillions of dollars of wealth for Chinese stock investors. China’s markets are dominated by retail investors. Working class Chinese people account for over 5/6ths of all of the national stock market transactions. Their overwhelming desire and pressure from their peers has led them to aggressively buy stocks. This has gone far beyond normal investing and reached extremes of "herd mentality". The Chinese people who had never before invested in stocks, scrambled to open brokerage accounts. They were in over their heads seeking to establish upward social mobility and financial success. This was "dumb money" which fueled the popular ‘speculative mania’ in Chinese stocks. The working class people did not have the proper experience nor education of the workings of their financial markets. This HUGE STOCK MARKET crash happening has wiped many peoples finances out. It lured in many ‘novice traders’ who have since quit their jobs, and put all of their lifesavings into the markets in hopes of making themselves rich. However, matters have gone terribly wrong for these investors recently, as they do not understand what they are doing! They never understood the stock markets and how risky they are. Many of them opened margin accounts so as to borrow money to make it happen! The margin debt was astounding. They hit a record high of $322B as compared to a record $507B of NYSE margin debt in US stock markets. Shocked traders, all over the world, believed that Central Banks control market cycles. All of the global Central Banks, with their extreme ‘easing’, has levitated stocks to even higher levels. The fact is, Central Banks can ‘artificially’ inflate stock market prices for only so long. The major danger signs were pointing towards the rise in margin debt in which we have not seen in recent years. Investors were borrowing tremendous amounts of money in order to fund purchases of stock. We witnessed this during the ‘dotcom bubble’ and just prior to the financial collapse of 2008. It is again happening, right before our eyes. This margin debt has pushed stocks to ridiculous highs, but it also served to drive stock prices down very rapidly when the market turned south. This is now about to occur in the US Markets. The Chinese government still continues to depreciate its’ currency. The key factor behind its’ Central Banks’ lowering of the yuan is a sharp decline in the growth momentum of exports, along with the yearly rate of growth declining. Mr. Donald Trump unleashed this tirade on Wolf Blitzer's CNN Situation; “China-these-are-not-our-friends-these-are-our-enemies”. They’re manipulating their currency. Intellectual property rights and everything else are a joke over there. They're making stuff that you see being sold all the time on Fifth Avenue, copying everything, whether it's Chanel or whatever it may be, the brands, and selling it. I mean the United States is getting ripping off for everything new or high-end ticket product they produce. The real economic slowdown in China was set in motion a long time ago, when the yearly rate of growth of the money supply fell from 39.3 percent in January 2010 to 1.8 percent by April 2012. The effect of this massive decline in the growth momentum of money places severe pressure on ‘bubble activities’. Anymore continuing of tampering with the currency rate of exchange can only make things much worse as far as the allocation of scarce resources are concerned. The U.S. Economy is ‘coupled’ to the Chinese Economy. In fact, it is ‘inextricably’ bound to the ‘global financial bubble’ and its’ leading edge in the form of ‘red capitalism’. In the face of an ‘unprecedented’ global collapse of the greatest phony boom, known in economic history, courtesy of China. Last Sunday night, March 20th, 2016, the Chinese stock market hit a two-month high by receiving news that the government will offer cheap short-term loans to stock brokerages. The Shanghai Composite Index rose by over 2% upon this news stating that the government will offer cheap short-term loans to stock brokerages. This additional "stimulus" kill their markets in the long run I feel as more debt is not the solution. I would like to point out, that corporate debt, as a share of GDP, is already far too high at 160%. “Quantitate Easing’ has not been the ‘Savior’ of our global financial problems”. It was advocated by John Maynard Keynes and Milton Friedman. The construction boom was financed by artificially cheap credit offered by the Chinese central bank. New apartment buildings, roads, suburbs, irrigation and sewage systems, parks, and commercial centers were built, not by private creditors and entrepreneurs. They were built by a cozy network of Central Bank officials, politicians, and well connected private corporations. Nearly seventy million luxury apartments currently remain empty. These projects created an epidemic of “ghost cities” in which cities built for millions are now only inhabited by a few thousand. The Chinese economy now has so many ‘ghost cities’ that debt has now grown into an increased unbelievable $25 trillion. What is occurring in the Chinese markets now will be the dissolution of an economy that capital markets have realized is simply not productive enough to enable servicing that amount of debt. Looking at the global markets as a basket using the GWL world stock markets EX-US stocks, the chart paints a clearly picture that stocks around the world in in a full blown bear market. The past two months have been nothing more than a bear market rally, also known as a “Bear Trap” which gets the uneducated investors buying back into the stock market thinking higher prices will continue, through that is not what will happen. There are some huge opportunities to trade various markets using inverse and leveraged ETFs. The FedEx founder and CEO reflects on how deregulation and opening markets have wrought astonishing changes and prosperity over 50 years. Adapted from remarks prepared for the 50th-anniversary reunion of the Yale University class of ’66. During our years at Yale, the world was a different place. Foreign travel was exotic, expensive and rare among the population as a whole. While some young Americans had been abroad, by far most Americans had not—and those who did go abroad most likely traveled by sea rather than air. In the early 1960s, flying over the oceans was mainly for the affluent. Long-distance telephone calls were expensive, international calls prohibitively so. From furniture to TVs and appliances, and especially automobiles, American brands dominated consumer spending in this country. We had just a glimpse of the world to come with the proliferating iconic Volkswagen VLKAY -1.71 % Beetles and the amazingly small Sony SNE -0.39 % portable transistor radios. These imported products in the U.S. represented a global political vision that pre-dated World War II. In the early 1930s, President Roosevelt and Secretary of State Cordell Hull believed in liberalized trade as a path to world peace and cooperation. With strong administration support, Congress in 1934 passed the Trade Agreement Act, which allowed Hull to negotiate reciprocal trade treaties with numerous countries, lowering tariffs and stimulating trade. This liberalization reversed the epitome of U.S. protectionism, the disastrous Smoot-Hawley Tariff Act of 1930, which contributed to a staggering 66% decline in world trade between 1929 and 1934. Integral to Hull’s vision was the 1947 General Agreement on Trade and Tariffs (GATT), which was signed by 23 countries and committed the U.S. to steadily liberalizing world trade. A central pillar of American postwar policy was enticing producers from around the world with access to the giant U.S. market. The devastation of Europe and Japan and the emergence of Cold War adversaries provided even greater impetus to the opening of American markets, under the protection of the U.S. Navy and the umbrella of various global alliances like NATO. In April 1966 Malcolm McLean launched his first international Sea-Land container operation between New York and Rotterdam. McLean’s shipping-container revolution cut the cost of seaborne trade by a factor of 50 versus loose-cargo stevedoring. That same month, Juan Trippe (Yale ’21) at Pan Am ordered 25 revolutionary jumbo 747 widebody Boeing BA -0.56 % airplanes equipped with equally leading-edge Pratt & Whitney high-bypass fanjets. When the passenger version of the 747 entered service in 1969, it was two-and-a-half times bigger than the Boeing 707 that had pioneered jet travel. The jumbo jet cut overseas travel costs by 70%. The 747’s hump allowed a freighter version to load cargo through a nose door under the cockpit and into the cavernous fuselage. Because of the cargo-carrying 747F, costs for trans-Pacific airfreight were dramatically reduced, a major factor in the extraordinary GDP growth of the Asian “tiger” economies of Hong Kong, Taiwan, Singapore and Japan beginning in the 1970s. Electronics and other high-tech/high-value-added goods from these emerging markets could be distributed and sold in the U.S. and Europe in a few days—an amazing development. During the 1970s and 1980s, while container ships and planes became increasingly efficient with each successive model, newly developed fiber-optic cables (patented in 1966) began running underseas, connecting the world at the speed of light, lowering voice and data-communication costs by orders of magnitude. Financial markets became globally integrated and transactions multiplied at an astounding rate. The U.S. opened its markets to former World War II foes, and Germany and Japan as a result became economic titans. Successive administrations mostly ignored Japan’s overt mercantilism and growing trade surplus, given the need for American military bases throughout the country. Eventually exchange rates and domestic political pressure pushed Japanese car makers to set up production plants in the U.S., mostly in the South. Electronics manufacturers such as Panasonic, PCRFY -0.79 % Sony and Hitachi HTHIY -0.91 % became world-wide giants on the back of exports from Japan to America and then almost everywhere as global trade steadily expanded. Parallel to the technological progress of transportation and telecommunications was a remarkable series of congressional actions and GATT agreements that substantially liberalized transport and trade regulations. During the Carter administration, inspired by extensive academic research and the example of ultra-low-fare intrastate airlines in Texas and California compared with high-cost national carriers, many Republican and Democratic lawmakers alike pushed for federal economic deregulation of transportation. The Republican mantra was “free market”; Democrats sought “consumer benefit” by lowering the price of travel and goods for the masses. As a result, legislation was enacted for air cargo (1977), passenger air services (1978), interstate truck and rail transportation (1980), and the federal pre-emption of intrastate trucking in 1994. Both the Civil Aeronautics Board (CAB) and the Interstate Commerce Commission (ICC), the air and surface economic regulators, were abolished, in 1985 and 1995 respectively. In the 10 years following the Staggers Act of 1980 that substantially deregulated railroads, the perennially loss-making rail industry was able to halve the rates charged to customers while restoring financial stability. Surface-transport deregulation also spawned an entire new industry of flexible truckload common carriers to meet the needs of emerging “big box” distribution and retailing models such as Wal-Mart and Target. Revolutionary production systems, based on just-in-time supply and fast-cycle manufacturing, were made possible only because of the deregulation of trucking. From 1977 to 1994, a century’s worth of heavy regulation of transportation rates, routes and services that had begun with the railroads was cast aside, with profound effects on the U.S. economy. By the beginning of the 21st century, overall logistics costs were reduced from 16% of GDP during the 1970s to under 9%, thereby making possible substantial increases in government social spending resulting from the Medicare and Medicaid legislation in the 1960s. On the global-trade front, the GATT framework of 1947 had been “temporary,” as Congress refused to approve the International Trade Organization envisioned by the participants at the 1944 Bretton Woods Conference that established the World Bank and the International Monetary Fund. Even so, under GATT there were seven successive negotiating “rounds” and agreements until the World Trade Organization (WTO), a modernized International Trade Organization, was finally established in Geneva in 1994. The GATT/WTO did not cover sea trade, given the traditionally liberal rules regarding shipping except within national regulated waters. Thus unimpeded, containership lines of many registrations proliferated, facilitating the astonishing growth in maritime business and the development of megaports in Asia, Europe and the U.S.
International aviation was likewise a separate regime, but as agreed by 54 nations at the Chicago convention of 1944, international flying was for decades tightly controlled by governments through a labyrinth of bilateral treaties (4,000 at present) that limited competition and regulated rates and services. Beginning in 1992, however, the U.S. and the Netherlands enacted the first of many Open Skies agreements, which have grown now to 117, including a multilateral treaty with 28 European countries. Passenger airlines opened scores of new routes. New air-cargo and door-to-door express services were also initiated. Together, these regulatory changes and transport innovations made possible the fantastic growth of travel and trade, which grew two-and-a-half times the rate of world GDP for a quarter-century. From less than $50 billion in total trade in 1966, the U.S. now imports and exports over $4 trillion annually in goods and services. Container ships have grown from carrying a few hundred boxes on each trip to the new Triple-E behemoths that transport over 18,000 containers called TEUs, or 20-foot-equivalent units. The cost is 1/500th of the shipping rates per pound of the early 1960s. The profusion of agricultural products from the “Green Revolution” pioneered by Norman Borlaug, combined with ever more efficient shipping, has resulted in massive amounts of grain traded around the world, something unimaginable to farmers 50 years ago. American railroads were integral to the growth in the nation’s maritime trade by moving containers from Pacific ports to the mega markets in the East. All of these factors have created a global trade market that exceeds $15 trillion annually. 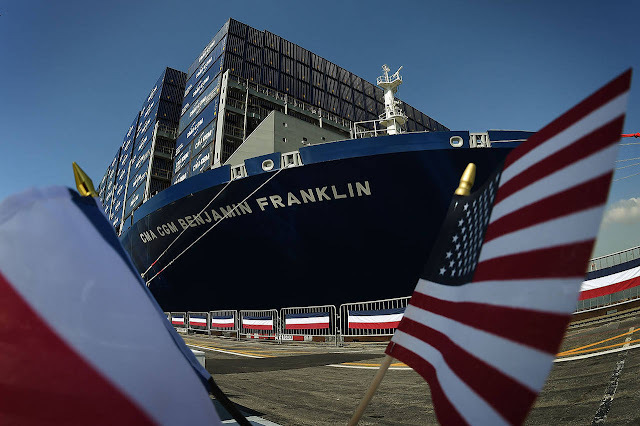 Now, the Panama Canal is being widened, which will permit, beginning later this year, massive container ships to cross the Pacific and unload directly into improved Gulf of Mexico and Atlantic Coast ports, further reducing the cost of Asia-U.S. trade. Handling the enormous increase in financial transactions was made possible by a fantastic increase in computer-processing power. The emergence of the Internet in 1994 has allowed the ubiquitous offering of millions of products for fast delivery from anywhere in the world to anyone with a desktop computer . . . then a PC . . . then a tablet . . . and now a smartphone. Languages are translated; products can be instantly, visually displayed; and orders effortlessly entered. The capabilities are unprecedented in the history of commerce. Three other factors central to the development of these enormous global commercial systems have occurred since 1966: The evolution of a vast world-wide oil market; the integration of the economies of the U.S., Mexico and Canada with the North American Free Trade Agreement (Nafta) of 1994; and the emergence of China as a great commercial power. The oil cartel known as the Organization of the Petroleum Exporting Countries overplayed its hand in the 1970s when, for economic and political reasons, OPEC embargoed shipments to the U.S. Market forces finally sorted out oil supply and demand in America after President Reagan in 1981 dismantled the vestiges of government regulation in the industry. Oil has hardly been immune to the vagaries of any commodities market, but the U.S.—thanks to the technological breakthrough of hydraulic fracturing—is the world’s largest producer of natural gas and is on track this decade to surpass Saudi Arabia and Russia as the world’s largest oil producer. True to the central tenet of FDR and Secretary of State Hull that liberalizing trade is inherently beneficial, the U.S. led the effort for China to join the WTO in 2000. Beginning with the Nixon-to-China rapprochement, the industrialization of America’s Cold War enemy has lifted more people—hundreds of millions—out of poverty, faster, than ever in history. From the late 1980s and accelerating after the WTO accession, efficient Chinese manufacturing, especially technology-based goods, has rewarded Western consumers with low-cost products that have substantially improved standards of living. Americans and Europeans don’t need to be affluent to afford cellphones, digital TVs, furniture and appliances. China, however, has followed Japan’s mercantilistic practices, which have led to a $300 billion trade surplus with the U.S., thanks to state support of Chinese industry and restrictions on foreign competitors. These policies have created a strong political backlash in the U.S., which made the recent congressional renewal of Trade Promotion Authority—which allows the president to negotiate trade treaties and was for years a routine process—extremely difficult. Today, given low growth in most of the world, rising wages in China and petroleum costs declining because of U.S. fracking technology, the trajectory of the world’s commerce is somewhat uncertain. Trade and global GDP are now growing roughly at parity. Following the 2008 financial crisis, protectionism has shown a troubling popularity in many countries, including the U.S. Stringent new security regulations have also slowed goods crossing many borders. The Nafta pact has clearly been an economic success. Over the past 20 years, U.S. trade with Mexico and Canada has risen to $1.2 trillion in 2014, from $737 billion. While the immigration issue often gets erroneously conflated with Nafta, the economic numbers tell a clear story. Moreover, some production is now moving back to North America from Asia, given lower transport costs, faster delivery, the increase in Chinese production expenses, easier customs clearance, and the more balanced nature of Nafta trade compared with the massive U.S. deficit with Asia—particularly China and Japan. Once again, in its own messy, unpredictable political fashion, the U.S.—after a hiatus during the first Obama administration—is pushing for further trade liberalization, with initiatives such as the Trans-Pacific Partnership, the Trans-Atlantic Trade and Investment Partnership, and the Trade in Services Agreement. The WTO likewise continues to push for a new Trade Facilitation Agreement dealing with security and customs issues; the WTO Information Technology Agreement; and a new overall world-wide trade agreement—the so-called Doha Round negotiations. These efforts by many nations under the WTO show continued commitment to further global integration despite the well-publicized difficulties in doing so. History shows that trade made easy, affordable and fast—political obstacles notwithstanding—always begets more trade, more jobs, more prosperity. From clipper ships to the computer age, despite economic cycles, conflict and shifting demographics, humans have demonstrated an innate desire to travel and trade. Given this, the future is unlikely to diverge from the arc of the past. Mr. Smith is the chairman and CEO of FedEx Corp.
NEW YORK – The US presidential election is still more than half a year away, and it is impossible to know with any certainty who will be nominated to represent the major parties, much less who will be the 45th occupant of the White House. But it is not too soon to assess the mood of the country's more than 320 million inhabitants and what it will mean for the man or woman who ultimately prevails in what must seem to most people around the world to be an endless political soap opera. The dominant mood in the United States today is one of considerable anxiety, if not outright anger. The Washington Post recently published a four-part series of articles revealing popular fury aimed at Wall Street, Muslims, trade deals, Washington, police shootings, President Barack Obama, Republicans, immigrants, and other targets. The beneficiaries of this state of mind are anti-establishment candidates who espouse policies in opposition to free trade and immigration reform and who call for a radical overhaul of current tax and spending policies. The details of what they advocate may well differ, but their platforms share a promise of radical departure from the status quo. The basis of this mood is hardly self-evident, as the country is better off economically than it was a half-dozen years ago, in the immediate aftermath of the 2007-2008 economic crisis. Over nine million jobs have been created since then, interest rates are low (making loans for homes and cars more affordable), and the fall in the price of gasoline is the equivalent of a $700 tax cut for the average American family. Moreover, the stock market has risen some 200% since its low of seven years ago, and millions of people who were without health insurance are now covered. Yet this good economic news is offset in many cases by weak growth in household incomes, which have stagnated in real (inflation-adjusted) terms for some 15 years. 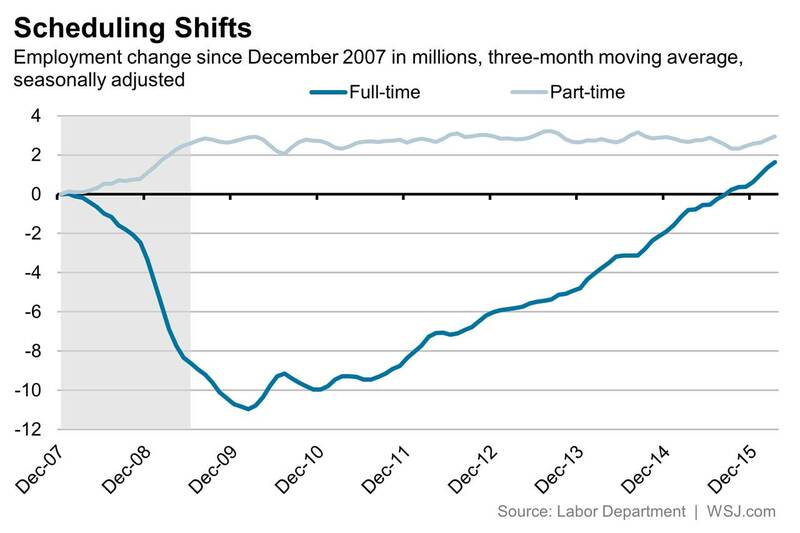 The percentage of Americans working full time has still not reached the level it was at seven years ago. And many fear that their jobs will disappear because of foreign competition, new technologies, or outsourcing. A large number of Americans are living longer, but are anxious, as they have failed to set aside the funds needed to ensure that their retirement will allow them to live comfortably into old age. Some are paying health-insurance premiums that they previously had avoided because of mandates in the reform enacted under Obama. There is also the issue of inequality. This causes real anger, but the problem is not so much inequality (which, though worse, is nothing inherently new) as it is the decline in opportunity. The American Dream is giving way to class consciousness – a profound change for a country founded on the ideal that anyone can improve his or her lot through hard work. But the reasons for anxiety and anger transcend economic realities and worries. There is also physical insecurity, whether because of crime or the fear of terrorism. In many communities, there is concern, too, about where the culture and the society are heading. Modern media tend to make things worse. Ours is an age of “narrowcasting,” not broadcasting. People increasingly tune in to cable channels or websites that reinforce their views and ideologies. Little of this is reassuring. The national mood transcends the election campaign and will pose a real challenge to the new president and Congress. The divisions within and between the Democratic and Republican parties will make compromise and the formation of coalitions that are essential for governing all but impossible. Concerns over retirement and health-care affordability will make it that much more difficult to reform entitlements, even though their expansion will drive up the national debt to record levels. Free trade is blamed for job losses and is losing support, even though it has also been a source of new jobs and greater consumer choice – and has strengthened America’s strategic position around the world. Immigration, long part of the country’s heritage and a source of valuable talent, is now the object of so much controversy that prospects for reform are dim. The mood of the US may also intensify officials’ domestic focus. Already turned off by foreign involvement in the wake of the Iraq and Afghanistan interventions, which cost much more than they achieved, many Americans are skeptical of what the US can accomplish abroad. They are frustrated with allies seen as not carrying their fair share of common burdens, and they are increasingly convinced that the government needs to focus less on the world and more on fixing what is wrong with the US. Some in other countries will no doubt read all of this with satisfaction; but, overall, it is bad news for much of the world. An America that is distracted and divided is less likely to be willing and able to take the lead in promoting stability in the Middle East, Europe, or Asia, or in meeting global challenges. And, without US leadership, these challenges are likely to go unmet, turning into problems or, worse, crises.